Been in here a few times and it's been packed on each visit. Always a good selection of beers with a few coming from their own micro brewery on site. Can be a bit steep for a pint but it's location lends to that. Less friendly then The Rake and can seem very in personal as it's a large open plan bar. 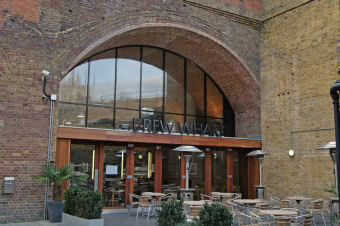 The Brew Wharf is a bit of a yuppies hang out and is more of a restaurant than a bar. It's not very well suited for a drink. Tables between the entrance and the bar were all 'reserved', despite an absence of customers. I opted to sit in an open seating area reminiscent of a Wagamamas but without the people. Two beers made on the premises were on - Wai-iti XPA & Black Cat Rye PA. There is also a good selection of Meantime beers on keg. You can see the cellar where the beers are brewed, opposite the large open kitchen. Seems to have ideas well above its station. That's a shame, as the brewpub principal is worthwhile. Like much of London a great deal of money has been spent on this place to make a great deal more money and it is clearly popular among the trendies with more money than sense. It does have an excellent view of the Shard, and I must concede that the ales - a 4.2% ABV mild and a 6.5% ABV IPA were very good - if �4 a pint. For me it was worth the visit and experience but I wouldn't hurry back. Interesting, but not my kind of place.